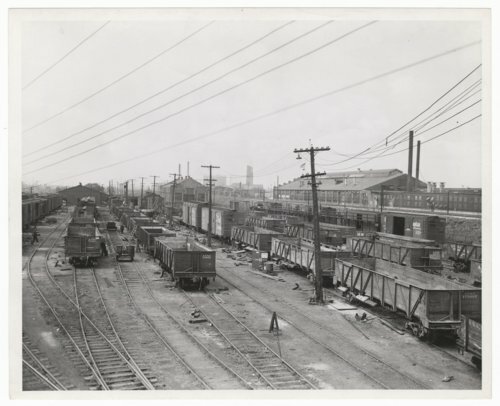 This photograph shows the Atchison, Topeka and Santa Fe Railway Company's Empire Car Shops and yard mill in Chicago, Illinois. Located at 36th and Kedzie Avenue, the facility started out as a private company in 1909. In 1919 Santa Fe took over the daily operation of the shops. In this photograph, Caswell gondola cars are being converted for the war effort and some of the 50' boxcars have raised roofs so they can carry aircraft wings, parts etc, to the West Coast for final assembly.